One of the vital features of any luggage is the ease of mobility, which it comes with. Buying an expensive bag does not necessarily mean that the quality of the wheels is not compromised. 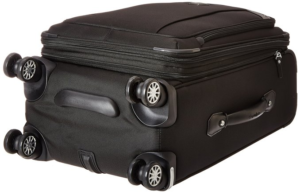 On the other hand, most cheap wheeled bags are not durable as they cannot handle much of the damage that comes with dragging luggage on both rough and smooth surfaces. The wheels themselves need to be in proper encasements in order to reinforce their protection and durability. Their functionality also needs to be good, that is, ball bearings need to be smooth and avoid getting stuck, from time to time. 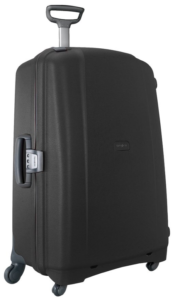 The further apart the wheels are, the better the center of gravity, contributing to easy mobility of this luggage. Understanding the spinner wheel and in-line/fixed wheels helps you purchase the luggage that is easily portable. Below is a quick summary, for more information you can view my in-depth luggage wheel guide. • Spinner Wheels – This wheels offer a cool 360 degree rotation mobility and do not require much strength or control from owners. The four wheels also aid in creating a stand-alone capability, when the luggage is not in movement but at times, it may some amount of stability from the hand. They can be tipped towards the user’s direction or moved straight on surfaces, enabling easy maneuverability towards just any direction. Most of the spinner wheeled baggage come with 4 wheels. • In-line Skate/Fixed Wheels – The main advantage of this wheels is stability, when placed on sloped surfaces. But when it comes to rolling suitcases, they are known to add pressure on your arm when being dragged around. They are also very noisy and have a tendency of getting stuck or breaking. • The Luggage Wheels Material- Polyurethane, a highly resilient flexible plastic makes the best wheels. Other plastics and rubber, wear down quickly. At times they have too much rolling resistance. Most in-line skate wheels are made of polyurethane and the most common luggage wheels available. • How Wheels Are Fastened to the Luggage Case- Screws provide excellent fastening unlike rivets, offering stronger and most importantly, they can be easily replaced when lost. Some suitcase makers also provide users with extra pairs of screws for emergencies. • Luggage Wheels Protection- Check-in luggage undergoes various security checks and in the process get mishandled. The wheels especially must be able to contain some rough handling. Wheels with protective casings last longer. Quality case protections include full corner protection and partial protection made from high tech plastics unlike having no single protection. Delsey Helium Shadow Bags are one of the most popular items of luggage that can be bought. They have been made and designed with a lightweight 100% polycarbonate, which is a highly impact-resistant plastic. There are several different sizes of bags that are available. Read the full review here. 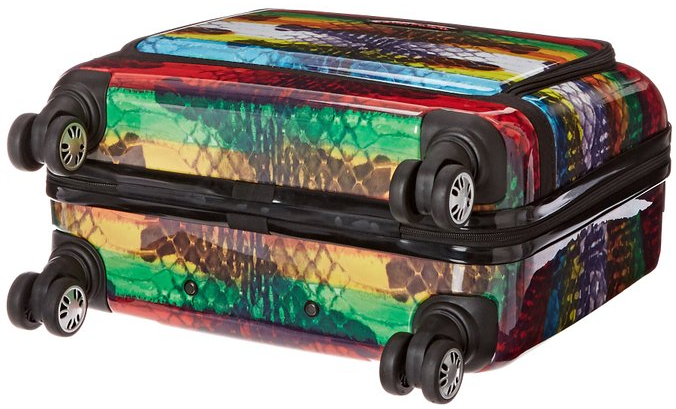 This suitcase has a luxurious patchwork design constructed from the best and finest materials, from its body, handles and wheels. This ensures durability and ease of use on any travel. When it comes to maneuverability; standing up and turning, this baggage comes with an eight 360 degree spinner wheels with foot bumpers to prevent it from rolling away when on slopes. This innovative travel bag features, the Eagle Creek design aesthetic, expandable pockets to provide users with maximum packing space and two- way lockable zippers. In its interior are multiple pockets for organization, compression wings. 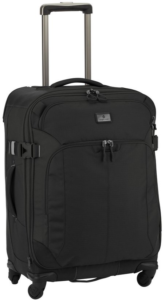 For easy mobility, this baggage has 4 travel tested multi-directional spinner wheels. These wheels work with weightless handle system for smart travel. This suit has 4 magnetic wheels that just roll smoothly. Its biggest selling point is the proprietary magnetic wheel alignment technology that greatly minimizes mobility frustrations that come with most spinner baggage. The wheels do not drift or wobble, making it easy to control the scooting of the bag as it glides smoothly on any surface. Contour grip on the handle greatly improves the comfort of pulling the suitcase on long distances. It is also a relatively lightweight luggage, comfortably fitting in most overhead bins any plane. But it may not fit in all overhead bins if all of its expansion capabilities are taken advantage of or when all the front pockets are stuffed with large items. 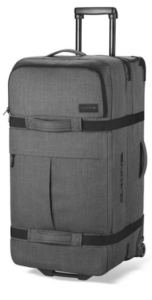 Expandable 8 wheeled luggage offer style and comfort when it comes to any type of travel. This type of wheel construction allows the case to stand uprights or be rolled in any direction. 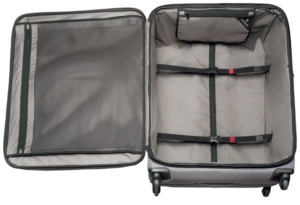 Designed and constructed from a lightweight and durable material, this suitcase has its corners molded and reinforced for maximum impact resistance. The expansion zipper located in the interior compartment gives users an extra carrying capacity when desired. Additionally, it features garment restraints to hold fragile items and zipper pockets for accessories. It also comes with a durable bottom grab handle for easy scooting of the case not mentioning the flexible top and side handles for easy lifting. Its side bezels can be used as an alternative to the wheels hence stand on its side. Apart from F’Lite GT world class styling and contemporary colors, its spinner wheels contribute greatly to first-rate functionally. 4, 360 degree rotating wheels provide easy mobility. Rolling upright is easy as there gravity got it covered hence minimizing weight on your arm or shoulder. A multi-stage monotube handle plays part in providing a less weighty grip. The case is lightweight thanks to the rugged polypropylene shell. The groove gasket closure will protect items, keeping out dirt and humidity. The luggage maker has set standards in making wheeled duffle bags. The bag comes with replaceable urethane wheels. It has a split-level design allowing for easy loading and unloading from luggage bins. All this contributes to the bag’s durability, serving you in years to come. Designed as a four-wheel upright case, regular travelers are sure of having the perfect travel companion. The dual-trolley aluminum handle system locks into three separate positions; 41-inch, 39-inch and 37-inch making it compatible with various user heights. A 4-wheel caster system means added stability, 360 degree maneuverability and zero weight-in-hand when rolling upright. An expandable 1.5-inch packing spaces means additional packing capacity. Other great features include lockable zipper sliders, zippered hanging pocket, web straps and a full-length mesh pocket to store small essentials. This entry was posted in Best Brands, Carry-On Luggage, Checked Luggage.